The SeaRAM Anti-Ship Missile Defense System is a sea-based self-defense weapon that protects naval ships from supersonic and subsonic threats. [i] These threats include cruise missiles, drones, and enemy aircraft, as well as small boats. The range of the SeaRAM is currently classified but is estimated to be similar to that of the MK-31 Rolling Airframe Missile (RAM) launching system at 9km. The SeaRAM is an improved system combining the MK-15 Close-In Weapons System (CIWS) Phalanx and the MK-31 RAM launching system. [ii] The SeaRAM is an 11-launcher system that has the MK-15 CIWS track and search radar and optic sensors. [iii] The defensive platform acts as complete weapon system that “automatically detects, evaluates, tracks, engages, and performs kill assessment against ASM and high speed aircraft threats in an extended self-defense battle space envelope around the ship.”[iv] This allows the system to engage multiple threats simultaneously without using other weapon systems on the ship. Also, as drone technology becomes increasing available and deployed, SeaRAM has proven its capability to shoot down incoming drones offering protection that is deployed around the globe and has mobility. November 2017: The USS Jackson shot down an aerial drone with the SeaRAM defense system. March 2016: The Navy successfully completes first live fire test of SeaRAM from destroyer. September 2015: The Navy began integration of SeaRAM on Rota-Based Destroyers. 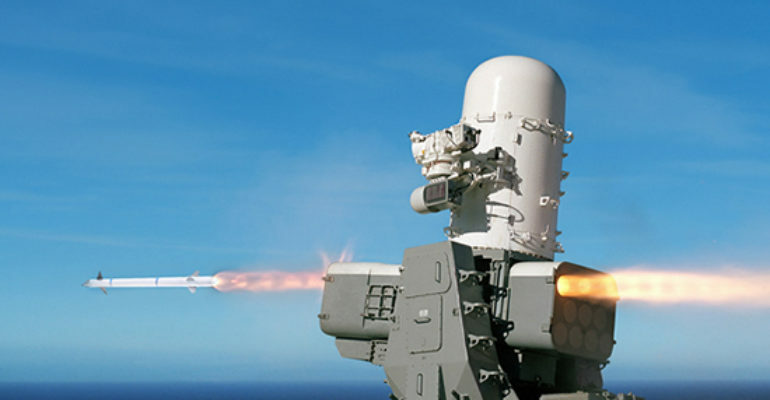 May 2012: The US Navy awarded a $57.8M contract to Raytheon for the manufacture of two SeaRAM missile defense systems. May 2010: SeaRAM completed two blast test vehicle launches from the USS Independence to validate the structural integrity of both the weapon system and the ship. 2009: A SeaRAM missile defense system was first deployed on the hangar roof of the LCS-2. March 2008: A SeaRAM missile defense system was delivered for deployment aboard the US Navy’s littoral combat ship, the USS Independence. August 2003: The first development modal was unveiled. December 2002: Raytheon received a $6.7M modification to an existing development contract from the US Navy. Late 2001: Raytheon and US Navy conduced test-firing of four blast test vehicles for measuring launch forces of the weapon system. 2001: Raytheon delivered an engineering model of the SeaRAM anti-ship missile defense system to the United Kingdom’s Navy for suitability testing.